Instead of using that old bed sheet your wife offered to cover up your prized possession, buy a beautiful car cover from Vettestorations. When you store your corvette either in the garage or outside, you will want to protect it from the elements. Our covers snuggly fit the Corvette body and keep it looking great when you take it off and drive! 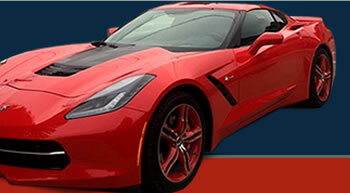 Would you like to set your corvette apart from the other corvettes on the road or at the shows? Vettestorations can add custom flames, ghost flames and custom pinstripes that will make others' heads turn. You will be the talk of the town. Our technicians will paint a sample for your approval prior to refinishing. professionally install your new top and weatherstrips. What a beautiful end result! We have a variety of choices for you to select from and match the size and dimensions to your model to enable you to have a comfortable, eye-catching ride. Vettestorations also offers custom hand embroidered floor mats and leather t-top bags to protect your t-tops while in transit. Looking for a corvette coffee mug, corvette t-shirt, corvette keychain, corvette poster, or corvette model for your favorite corvette fan?We can help you find that perfect gift too!